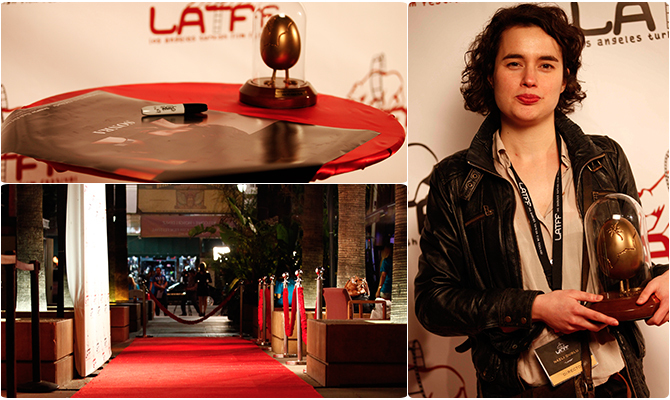 Second Los Angeles Turkish Film Festival announced this year’s award recipients in short film category. The awards were presented at a ceremony in the Egyptian Theater. Running through 28 February - 03 March 2013, the Festival presented four awards: Award for Best Short Film, Audience Award and two Jury’s Special Awards. The head of this year’s jury was headed by Semih Kaplanoğlu. The jury also included Belçim Bilgin, a talented actress from Turkey. The American jurors are Ron Yerxa, President of the Academy’s Foreign Language Executive Committee; Howard A. Rodman, Vice President of the Writers Guild of America West and Academy Member; and lastly Rob Nilsson, director- producer, most notably winner of Caméra d'Or at the 1978 Cannes Film Festival. Golden Egg Best Film Award winner is "Later" (Nazlı Elif Durlu). "Vanished Into Blue" (Abdurrahman Oner) has won Special Jury Award. "Mesut" (Hakan Hucum) has won both Audience and Special Jury Award.